Ram nation got a sneak peak at this year’s team Saturday afternoon at the Siegel Center. 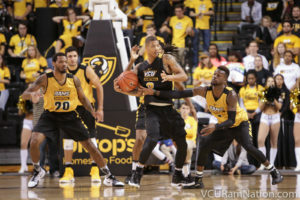 Coach Will Wade held the annual Black and Gold scrimmage where there were certainly a lot of new faces. After introducing the new players and welcoming back returning players, the rams faithful got to see what the team had been working on in the off season. Senior Jordan Burgess got off to a hot start and pretty much maintain his shooting streak throughout the game. It looks as though his shot is dropping consistently after putting in some long hours in the gym this summer. Junior Johnny Williams showed even greater flashes of quickness in the paint while senior JeQuan Lewis seemed to have strengthened his outside shot as well as working on his leadership going into his final season. Incoming freshman Malik Crowfield teased the crowd with glimpses of his long ball, something that his teammates and coaching staff have really been impressed with. Lewis led all players with 16 points while Williams chipped in 15. Senior Doug Brooks went 4-9 from three point land, scoring 12 points in the scrimmage. Freshman Samir Doughty did not disappoint after sitting out last season. He grabbed 4 boards and scored 13 points. Junior Justin Tillman grabbed 8 unassuming rebounds in his traditional quiet reserved fashion. VCU will play an exhibition game on Friday November 4th in Queens, NY and will return to the Siegel Center on November 11th for the season opener against UNC-Ashville at 7pm.